Hi everyone! I just returned from a special taping of the radio program, recorded in celebration of Martin Luther King, Jr. Day, and held at the incredibly beautiful Bethel AME Church in the Jamaica Plain neighborhood of Boston. There was some fear regarding whether we’d all make it to the show as it’s been snowing non-stop here in Boston, but everyone arrived safely, we had a full audience, and everything went off without a hitch! It was quite an inspiring show to say the least. A major part of the show was the Boston Children’s Chorus, a fantastic organization known for their televised Martin Luther King Day, Jr. concerts. They brought their magic to the From the Top stage, singing a variety of beautiful works. I especially loved their opening performance. Instead of our usual From the Top theme, the chorus sang a song called MLK, which was originally written by U2. 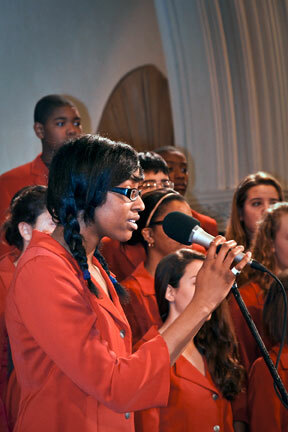 It featured a teenage soloist from the chorus, whose voice was just mesmerizing. I also loved the offbeat piece Chris played during the break of the show, which called for the audience to literally grunt in rhythm as the chorus clapped along and Chris played (and sang)! The show also featured a wonderful teenage string quartet from the Boston Youth Symphony Orchestra performing a movement from “Calvary” by Coleridge-Taylor Perkinson, and alumni flutist Chaz Salazar, whose performance of William Grant Still’s “Summerland” was stunning. Make sure to tune into this special From the Top episode airing during the weekend of Martin Luther King, Jr. Day!